Most plants are healthy, in part due to metabolic interactions between the holobiont’s host and its microbiome, usually involving secondary metabolites. On the one hand, the host welcomes some boarders, e.g., those involved in mutualistic interactions. On the other hand, host defense prevents the microorganisms from gaining control. Consequently, the microorganisms react and have evolved mechanisms to deal with host defense, e.g., by downregulating it or by synthesizing antagonistic metabolites. The microorganisms must also deal with competition between other members of the microbiome for territory and assimilates. Examples of the secondary metabolites involved in these interactions are presented, including phytohormones, signaling molecules, phytotoxic metabolites, and antimicrobial metabolites directed toward coinhabitants of the microbiome. In the healthy plant, there are multiple equilibriums between the antagonisms of the plant residents and also between inhabitants and their host. The sum of these interactions is a healthy plant with balanced associations between all members of the holobiont. Nevertheless, multiple abiotic and biotic factors can disturb this balance, including virulence of an alien pathogen, e.g., Hymenoscyphus fraxineus, the causal agent of ash dieback in Fraxinus excelsior. 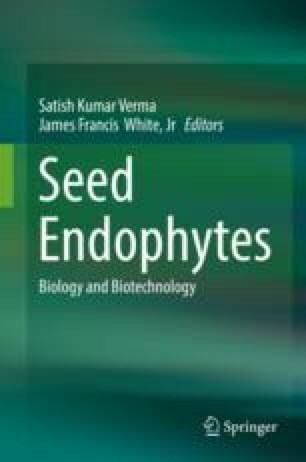 Strategies are presented in which fungal endophytes could be used to combat ash dieback. We would like to thank Drs. Simone Bergmann, Sophie de Vries, and Christine Boyle for critical comments and excellent suggestions for improving the manuscript and Nicole Andrée and Patrick Bork for the permission to use photos and results from their dual culture experiments and express our gratitude to Dr. Frank Surup for drawing the structures in Figs. 9.1 and 9.2.